Stroll back in time and discover the mysterious beginnings of New Orleans during this walking tour. 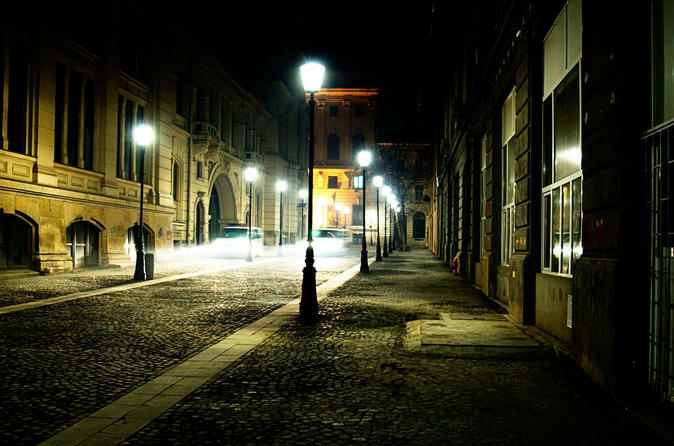 Guests will head down dark alleys and shadowy streets at night. Hear true crime stories in the Crescent City from your guide, who uncovers the hauntings of sites laden with the supernatural. Guests will be allowed to stop and get to go drinks during the tour. Join us on a tour where learning is intoxicating. Take a walk through the dark streets of New Orleans at night and discover its ghostly history with your guide. Learn about the legacy of the infamous Marie Laveau, dubbed the Voodoo Queen of New Orleans. Perhaps you'll glimpse the apparition of a beloved figure, Pere Dagobert, at the St. Louis Cathedral, one of the great landmarks of the city. Dare to step foot at the Sultan's Palace, a mansion with a sensational story of murder and massacre — a tale for the faint of heart. Listen to the bone-chilling tale of the Madame LaLaurie Mansion, long regarded as one of the most haunted houses in the Crescent City. Walk alongside the spirits of the Civil War at a legendary haunt called the Beauregard-Keyes House, the former home of the namesake Confederate general. Your 2-hour tour finishes in the French Quarter.